The Hubble telescope reveals a rainbow of colours in this dying star, called IC 4406. 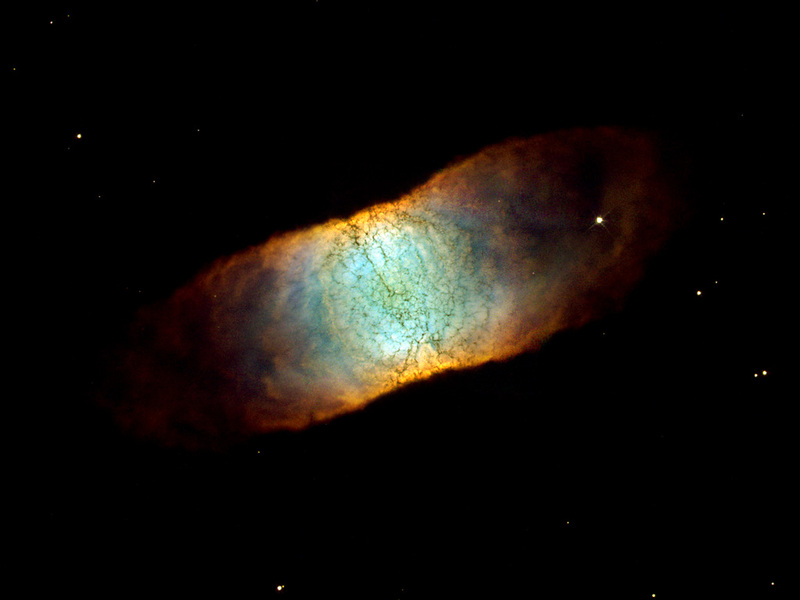 Like many other so-called planetary nebulae, IC 4406 exhibits a high degree of symmetry. The nebula's left and right halves are nearly mirror images of the other. If we could fly around IC 4406 in a spaceship, we would see that the gas and dust form a vast donut of material streaming outward from the dying star. We don't see the donut shape in this photograph because we are viewing IC 4406 from the Earth-orbiting Hubble telescope. From this vantage point, we are seeing the side of the donut. Position (Dec): -44° 9' 3.03"